Without people on your platforms or streets, your stations and towns can look like ghost towns. In the best case, the right figures, effectively used, lend a sense of proportion and purpose to your railroad that nothing else can. And it's worth remembering that visitors who are not railroaders or gardeners are going to spend at least as much time looking at your communities as they do looking at your trains and plants. 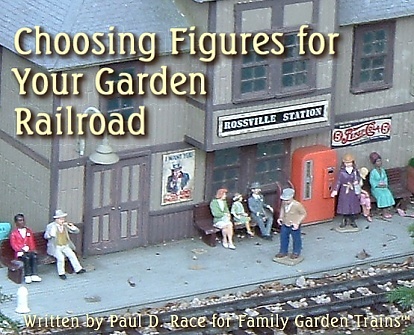 That said, there are almost as many choices of figures for garden railroads as there are trains. And a garden railroad with a few well-chosen figures will be more effective (and probably less expensive) than one that is crowded with a mishmash of figures in obviously different scales and periods. To choose figures most effectively, you should probably consider a number of issues of period and place, scale, and aesthetics. Issues of Period and Place - When you started your garden railroad, you may not have been too concerned with the time or place your that your railroad represents (just as most visitors won't notice if you are running modern diesels next to old-timey steam locomotives). But as your railroad matures, you may find that you want to represent a time and place that is more specific than a generic "town" somewhere in America, somewhere in the last two centuries. The Bavarian guy in the liederhosen no longer looks right next to the tough guy on the motorcycle. There's nothing wrong with having different communities on your railroad represent different times and places. But within a single community, you probably want all of your people to look like they came from the same country and century, at least. Yes, most manufacturers of Large Scale figures try to make them as "generic" as possible. But no figure can really span all periods and all continents. Think about the time and place of your railroad and the communities it serves. Then think about whether one or more of your figures are creating a "time warp," or at least a "space warp." Issues of Scale - Just as Large Scale trains come in several diffent scales, so do the figures meant to go with those trains. And despite what some of my friends say, people don't really come "in all shapes and sizes." For example, if you see a 6'6" real person standing next to a 5'5" person, chances are that their heads are about the same size, and they are about equally wide, even though their height is different. If the short person was actually proportioned the same as the tall person, he or she would look like a midget or mannikin next to the tall person. The picture above shows a collection of figures that are commonly used with Large Scale trains on garden railroads. Except for the Lemax fireman at the right, the rest are all advertised as "suitable for use with all G scale trains" or some such. Surely they can't all belong on the same station platform. The relationship your figures bear to your buildings and trains is just as important as the relationship they bear to each other. Figures that look right with standard gauge trains (such as those by AristoCraft, USA Trains, and MTH) will wind up eye-level with the doorknobs on many Pola buildings, and some of the larger Piko sets. On the other hand, figures made to go with narrow gauge trains (such as those made by Bachmann and LGB) will be able to stare into the cabs of some standard gauge locomotives. When was the last time you stood on the ground beside a real train and were able to look directly into the cab windows? Sadly, buildings for Garden Railroads aren't labeled for scale any better than people are. Since I mostly run standard gauge trains, I look for buildings with doorways under 3.5 inches, with other details, etc. to match. 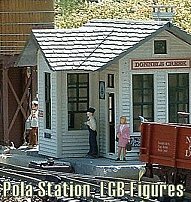 If you get picky about it, you'll notice that many Pola buildings have doorways that are 4 inches high, making them more suitable for use with narrow gauge trains from Bachmann and LGB than for standard gauge trains. The photo at the right shows two stations set side-by-side on a children's railroad in Ohio. 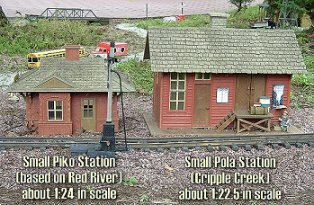 By the way, some Piko stations are just as large in scale as the Pola station shown; the Red River station is just one example of a station that is better suited for a smaller scale. Once again, nothing on the packaging of either station tells you that a building will work better with one kind of train or another. Are your figures "believably still" or "frozen in time"? 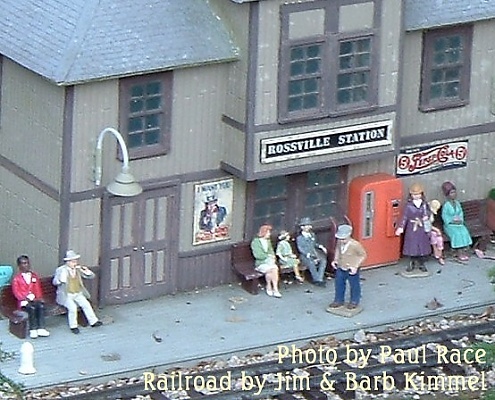 - Marc Horovitz, editor for Garden Railways, would rather use figures that look like people "caught" in a state of inactivity (such as loafing on the job) than those who look like they froze solid in the middle of some activity (such as "running for a train"). And I can see his point that a figure naturally "at rest" can make the overall setting look more realistic than a person who looks like his feet froze to a block of ice while he was heading somewhere. One example is the Lemax "kibbutzer" watching the checker game in the photo below. Though he came with the checker players, he can be positioned to be apparently observing anything. The fact that he never moves from that position seems rather more realistic than less. On the other hand, my own railroad has its share of people who look like they're in the middle of some activity, so the choice is yours. Can you suggest "signs of life" with fewer figures? If I understand him properly, Marc would also rather see details that suggest humanity, such as a clothesline or an ax left in a stump next to a woodpile, than to see crowds of figures standing around in what he calls "plastic puddles." That said, I think that well-chosen figures add purpose, period, proportion, and a human dimension to your railroad, as long as they are carefully selected. 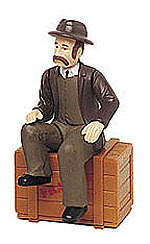 Figures that go with narrow gauge Large Scale trains such as Bachmann Large Scale and most LGB. Figures that are in between, but which may be useful with narrow gauge or standard gauge trains if you are careful with choice and placement. Figures that go with standard gauge Large Scale trains such as AristoCraft, USA Trains, and MTH. Figures scrounged from other sources, including toys. Bachmann figures (about 1:20.3) - At this writing, Bachmann makes only male figures from about a century ago. These figures they are not much taller than LGB figures, but they are more "stout." Because of this proportion they look more like "husky" men who are 5'4"-5'6" tall (as most men were a century ago). This makes them a better fit for 1:20.3 trains, such as the Bachmann Shay and Heisler than for the 1:22.5 trains, such as the Bachmann and LGB starter sets. Their arms also move, which means you can "stage" them in different ways, if you'd like. However, if you have mostly AristoCraft, USA Trains, or MTH, these folks will look a little big for your trains. LGB started modern garden railroading, and their figures were available years before anyone else was making figures that looked right with LGB trains (mostly about 1:22.5 in scale). So there are a LOT of LGB figures "out there." 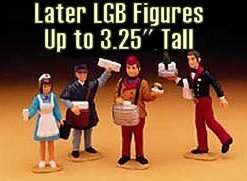 The first generation of LGB figures was fairly small, which was probably fair, because they represented an alpine population of a century ago. Since then, LGB people have been getting slightly larger. The first generation of LGB figures were also shiny, and looked very plastic. Today's LGB figures are finished with a "flat" paint that looks far less plastic. That said, I've left some of the first-generation folks in the weather for years with no apparent effect, but I can't vouch for the "flat-painted" folks weathering as well. LGB figures look especially good with LGB trains and with Bachman starter sets. Preiser makes very high quality molded figures in many sizes, including 1:22.5, the "right scale" for Bachmann starter sets and most LGB trains. The Preiser "premium" sets have very good painted detail - you can even see the whites of the little people's eyes. This makes them great for use in museum-quality displays or in locations very close viewers. 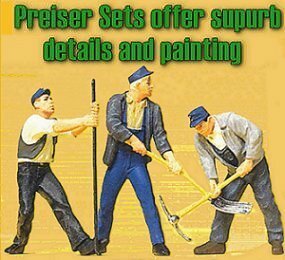 Though many dealers don't carry them, Preiser also makes a few sets with slightly less detailed paint jobs. All the paint jobs are "flat," so the little figures don't look too plastic. However, I'm not certain I'd be comfortable about leaving the more expensive ones out over the winter, as I have done with the old LGB folks. The Preiser 1:22.5 figures look especially good with LGB trains and with Bachman starter sets. If you model scales other than 1:22.5, you should know that Preiser makes figures in 1:24, 1:32, and many other scales as well, but not as many different kinds of figures may be available. 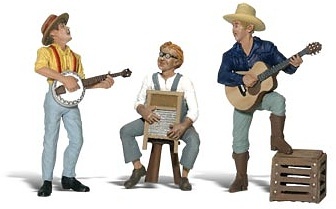 Just Plain Folk is a line of hand-painted resin figures that is actually made in the USA. Due to hand-finishing, every figure has a "custom" look. These tend to be about 1:22.5, making them especially useful for folks with LGB or Bachmann starter sets. John Schneider, who makes these is working on a new web page - JustPlainFolkFigures.com. He also likes going to big train shows, so you may meet him there. Or you can contact John at justplainfolk@verizon.net or 856-786-0080. Woodland Scenics (about 1:20.3) This is a relatively new line that isn't available everywhere yet, and I have only seen a sampling. My friend Dave Smith tells me he thinks they seem close to 1:20.3. He thinks that some of them look more like caricatures than serious "models" of real people. I think some of them are quite interesting, though, and could make a fun addition to your narrow-gauge railroad. Back when garden trains were in their infancy, a number of vendors, including Delton Locomotive Works, decided that 1:24 was a good scale to use because so many accessories were already available from the dollhouse manufacturers. To this day, 1:24 is a common scale for buildings and accessories to go with Large Scale trains. The theory is that means that people from both ends of the scale spectrum would use them. Unfortunately, Large Scale narrow gauge is getting larger (moving from 1:22.5 to 1:20.3) and some Large Scale standard gauge trains are getting smaller (MTH is manufacturing in 1:32, instead of 1:29, the scale of AristoCraft trains). So the "middle ground" is getting a little harder to hold. That said, if you have any 1:24 trains, such as those made by HLW (Hartland Locomotive Works) or Delton (reissued as AristoCraft Classics), you'll find these figures especially helpful. If you have any other brands, they can still be used if you're careful where you put them. AristoCraft (advertised at 1:29, closer to 1:24). Although AristoCraft has a very high standard of quality in their trains and track products, their figures are slightly less impressive. To me, their facial expressions, skin tones, and relatively shiny paint jobs are less convincing than some of other brands. Many AristoCraft figures seem close to 1:24, slightly larger than they really should be to go with AristoCraft's 1:29 trains. That said, the line includes individual figures you may find useful. Lionel (about 1:24) When Lionel discontinued their Large Scale line, they also discontinued one of the best bargains in Large Scale figures, a set of several nicely detailed, soft plastic railroad workers. The plastic from which they were made was soft enough to allow you to drive stiff wires (like unbent paper clips) up into their legs to use to hold them in place more permanently. These are large enough to look okay on a narrow gauge railroad, as long as you don't stand them next to a new LGB or Bachmann figures. I use a set on my standard gauge railroad, but I keep them in the foreground (to enhance "forced perspective") and I keep them away from figures that are much different in size. MTH (Railking 1 Gauge) (about 1:32) In the early 2000's, MTH introduced a line of standard gauge trains in 1:32 scale. Although it is actually the most accurate scale for representing standard gauge trains on 45mm track, this is the smallest scale in which garden trains are mass-produced. The doorways, for example, are about two-thirds the size of the doorways on Bachmann and LGB trains. So figures from companies like LGB and Bachmann look like giants surrounding MTH trains (and actually they're a little too big to look right to the "trained eye" alongside AristoCraft trains as well). MTH to the rescue, with a line of well-proportioned, well-painted figures. The ones I have seen lately are almost as nicely painted as the Preiser figures, though they don't have quite as much "personality." If you model standard gauge trains, get some of these folks around your equipment to give visitors some idea of how big those mammoth steam locomotives really were. Lifelike (about 1:32) Sadly, this line has also been discontinued, but you may still find a few pieces. They are shiny and "generic" like many of the older LGB people, but they are relatively cost-effective, and they are the right size to go with standard gauge trains such as those from AristoCraft, USA Trains, and MTH. These figures come lightly glued to clear plastic, so you can easily sprinkle sand or something around their feet and give the impression that they're standing on their "own," without relying on bulky bases. Like the Lionel railroad workers, the plastic from which they are made is soft enough to allow you to drive stiff wires up into their legs to use to hold them in place more permanently. USA Trains (about 1:29) For their fine lines of passenger cars, USA Trains has created a line of sitting passengers. These little folks will also fit into most other passenger cars, although if you use them in 1:24 or 1:22.5 cars, you'll need to raise them a little so they show up properly. 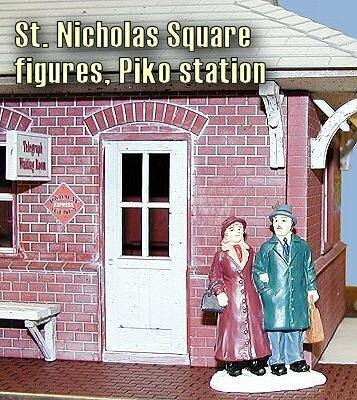 The figures I've seen so far are relatively skimpy on detail and have shiny finishes, so I'm not sure they would do as well on a station platform. . 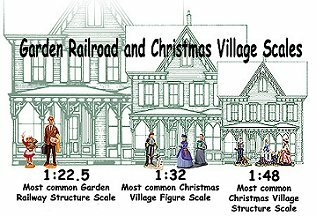 Figures from Holiday Village Collections - Another source of figures that you see on garden railroads include those from companies that make holiday villages, such as like Dept. 56 and Lemax. 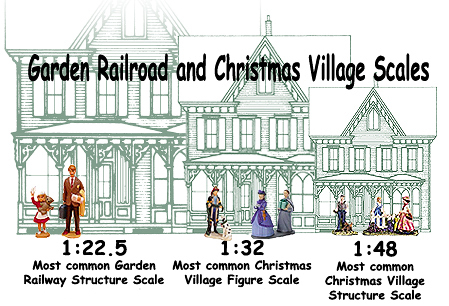 Most holiday village structures are close to O scale (1:48). But most holiday village figures are in larger scales, such as 1:32, because otherwise they'd be overwhelmed by the structures. Dept. 56 figures, which are top quality and made of porcelain (about 1:32). They're a little too expensive and a tad too fragile for me to personally feel comfortable using them on my garden railroad. 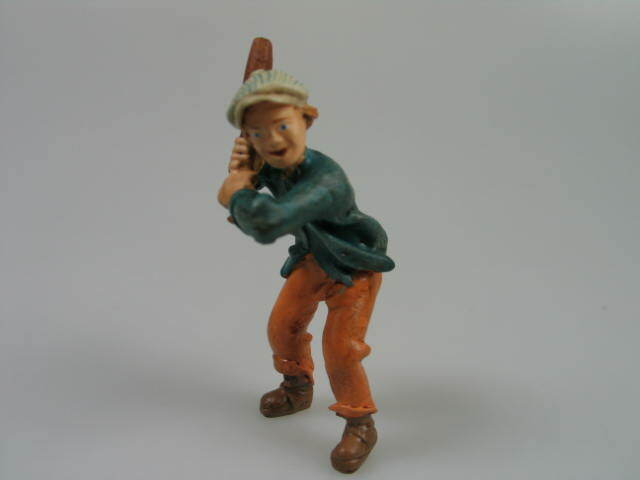 Lemax figures are good quality, made of resin and hand-painted. Their overall size is usually about 1:32, which makes them a good size match for standard gauge trains by AristoCraft, USA Trains, and MTH. (about 1:32). They're inexpensive enough and sturdy enough for garden railroader to consider using, especially those who use mostly trains in the 1:29-1:32 scales. 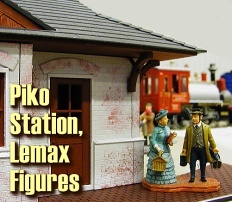 In fact, the first resin figures I bought for my garden railroad were from Lemax, and I was so pleased with them that I posted a popular article on the Family Garden Trains web site about them and similar products, including some of the following advantages. 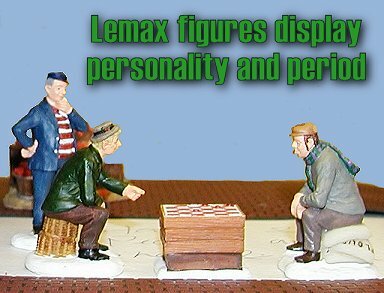 Lemax figures have more character and detail than many plastic "train people." Yes, many of the Lemax figures seem to have the same face, but their clothing and accessory choices give clues to the presumed "personality" of the people they represent. 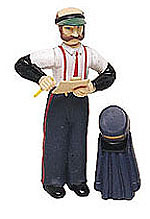 Many Lemax figures have period clothing that establishes a specific historical period (rather than the generic somewhere-between-1920-and-1980 outfits of most plastic train people). While this means you have to be more careful picking out and arranging figures, once you have done so, you will establish the time and place of your RR quite effectively. Lemax figures and accessories are less expensive than their plastic counterparts, even before they go on half-price sale after Christmas (which hobby-shop figures almost never do). Lemax figures generally have nice paint jobs. Some even have two-tone shading or "washes" on their clothing or accessories to give them a more three- dimensional or weathered look. In fact, when I can find appropriate figures, they look better near my more carefully-weathered and detailed structures than my plastic figures do. Many of them are too small to look right with Narrow Gauge garden trains (1:22.5 or 1:20.3). However, they look good with my AristoCraft trains, so that doesn't bother me personally. Most of them are too short for their overall proportion: their legs aren't long enough for whatever "scale" they are in. The designers seem to compensate for the extra quarter-inch or so of "snowdrift" base by shortening the figures' legs the same amount (or more). If you stand a Lemax figure inside a newsstand where its legs don't show, you'll never notice. If you have only Lemax figures in a grouping you'll probably never notice either. But it is worth mentioning. You'll need a good "eye" for period and culture if you don't want to wind up with a "hodge-podge" of clearly-defined, but different times and places. Some of the clunky bases are even more objectionable than the "plastic puddles" that stabilize most plastic figures. They're also WAY harder to saw off without breaking something. I compensate in some cases by standing the characters in sand or fine gravel and spreading the medium around their shoes. Some of the figures have inconsistent painting and detailing - Even if you like one of the figures, it pays to go through several "identical" packages and pick the one that has the best paint job. Look especially at their faces, as those are harder to "fix" than clothing that didn't get properly painted. Many of the characters are wearing overcoats, mufflers, etc. I try to avoid buying ones that I can only use at Christmas. In addition, though the paint jobs often are very good, the figures are not completely protected against the sun's Ultraviolet rays. You might want to consider getting some of that spray that photographers use to give their photos UV-resistance. Last, but possibly the most frustrating, is the fact that the Lemax figures come and go so fast, that by the time you see one you like, it may already be off the shelves. And even when it's in the stores it might be mixed with other, cheaper brands, all labeled "Caroltowne" or some such. So there's a real "scavenger hunt" aspect to finding usable Lemax characters. When you get an especially useful set (like the checker players and their kibbutzer friend above), you feel like you've really "won" a jackpot. But this frustrates people who are used to being able to order out of a catalog (the way you do Preiser). St. Nicholas Village (Kohls' brand) is also made of resin; it is slightly lower in quality than Lemax, and slightly smaller, with some figures as small as 1:40. Some St. Nicholas Village figures are usable, though. When looking them over, you'll notice that they share most of the Lemax disadvantages, such as stumpy legs, repeating models, and winter wardrobes. However they have a little less personality and originality. That said, they may "fill in the gaps" for you, especially if you can get them at a discount and you don't have many figures yet. The photo at the right shows a couple that I have used inside a station, propped up on a small wood block to give them height, looking through a window - if you can't see the snow drift, long coats, and stumpy legs they're quite useful. I also have an African American businessman who looks great on a station platform. 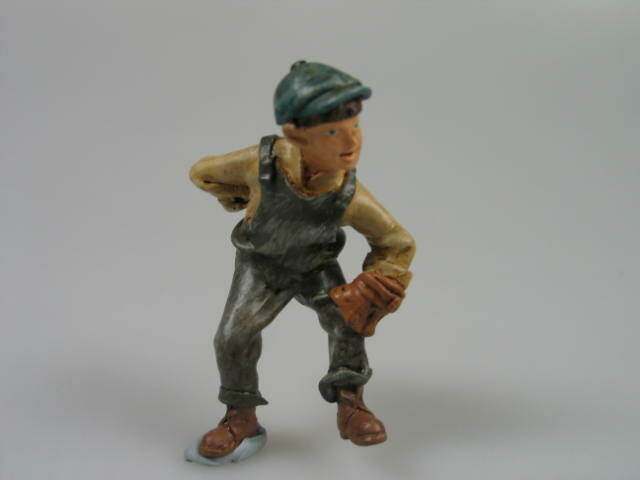 Hawthorne Village figures are top quality, made of resin and too small for most garden railroads. They are designed to go with the Thomas Kinkade and other Hawthorne Village trains and communities, most of which are O scale or smaller. Ironically, these figures are the only widely available branded "holiday village" figures that are actually the right size for the holiday village structures that they are sold to go with. Unfortunately that makes them a better match for O scale trains, such as Lionel O Gauge trains or Bachmann On30 trains than for garden trains (which are half-again to twice as large as O scale trains). In other words, they are too small (and really too expensive) for most garden railroad use. Off brands and way off brands, both porcelain and resin. These are usually useless for garden railroads, because they are too small to look right with any garden train. One brand commonly sold at JoAnne Fabrics has people as short as 1 5/8", putting them about 1:40, or more suited for indoor Lionel railroads. Off-brand figures also tend to be of much lower quality than any of the "name-brand" figures. On the other hand, if you've been volunteered to set up a Christmas train at your community center or some place, and you're leery of leaving your $6-12 figures out, some of these may save your "collection," while keeping the general public reasonably satisfied. I don't have any great photos, but I have noticed some creative use of figures from other sources on other people's railroads. A "Curly" figure left out of a "Three Stooges" set was the right size and had just enough detail to look right in a village on one railroad. I have also seen a Grover Cleveland figurine that must have been mislaid from a set of Presidential figures. In both cases, I was the first person who had noticed the "celebrity" hiding in the communities - they were that close in quality and scale to the hobby shop figures. When you come across such a figure and wonder if it will be useful, determine if it is about the right size, represents about the right period, and has about the same amount of detail as the other figures that it will be near. This standard generally rules out figures such as the birthday cake decorations that look like a baseball team, or the blank-faced plastic workers that come with some toy truck, construction, or farm sets. Update for 2009 - I just came across a few other "off the wall" sources for people you might could use on your railroad. They're documented in our More about Scrounging Figures article. With "hobby shop" figures is that you can count on getting exactly what you want, in the scale that is right for your train. 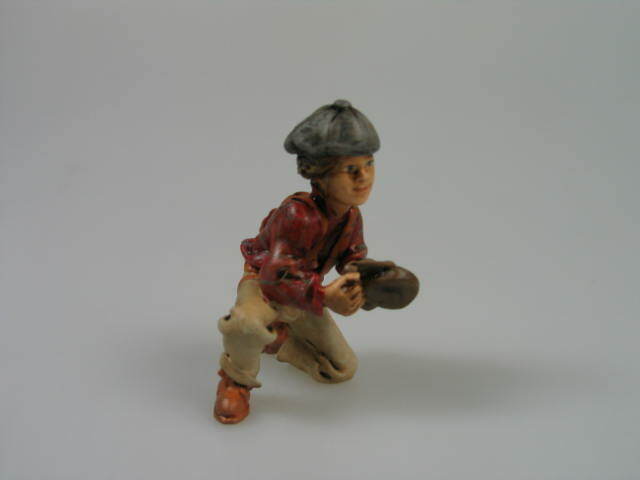 What holiday village resin figures such as Lemax lack in proportion and in availability, they often make up for in "personality," realism of detail, and sense of period. If you like scrounging unusual sources, keep your eye out at garage sales, flea markets, and thrift shops; you may find some unique and useful pieces, but remember you're the person who has to be satisfied with your "finds." Appendix: What do All Those Scale Designations Mean? 1:32 is a scale in which the model is one thirty-second the size of the real thing. This is the scale of MTH trains. It is also the scale of the LifeLike figures that were advertised as "G scale;" although they're not made any more, there are still some on the shelves. The better Holiday Village people, such as those by Lemax tend to be 1:32 or so. Off brands tend to be smaller, all the way down to 1:48 (the right size for Lionel sets). 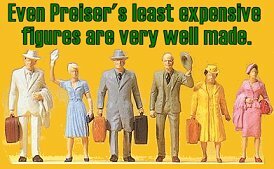 Preiser also makes several lines of 1:32 figures, although they are harder to find in the States. Many of Britains' animals and models and some of the Ertle farm sets are in this scale. 1:29 is a scale in which the model is one twenty-ninth the size of the real thing. This is the scale of most AristoCraft trains. 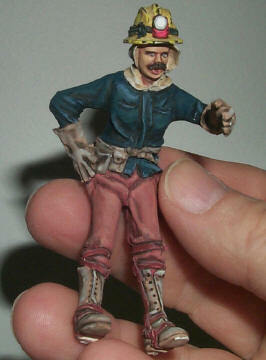 It's worth noting that very few figures are produced in this scale, since most AristoCraft figures are closer to 1:24. Nevertheless, I've been able to populate some 1:29 communities effectively with LeMax and LifeLike 1:32 figures and a few Lionel 1:24 figures - I just don't stand them next to each other. 1:24 is a scale in which the model is one twenty-fourth the size of the real thing. This is the scale of most Hartland Locomotive Works trains. It is also a common (though not the most common) dollhouse and "toy soldier" scale. Most AristoCraft figures and the Lionel railroad worker figures (if you can find them) fall about into this category. 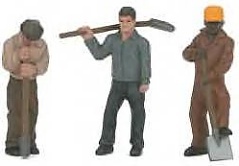 Preiser also makes a few US-style figures in this scale. 1:22.5 is a scale in which the model is 1/22.5 the size of the real thing. This is the most common scale for LGB European trains and Bachmann Large Scale starter sets. 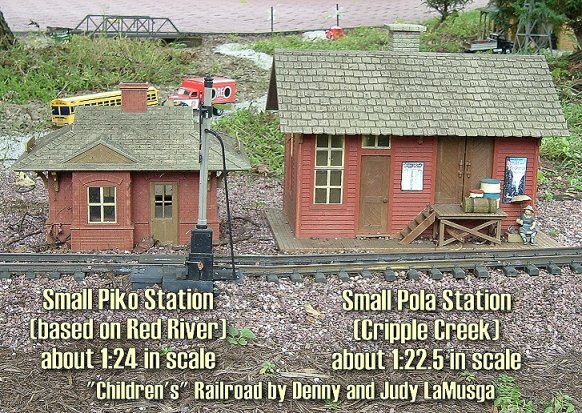 It is also the most common scale for model buildings made to go with garden trains. 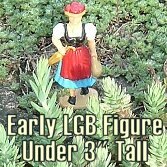 Most LGB figures fall about into this category, although LGB people have been growing a little taller over the years. Several companies, including Preiser, make figures in this scale. 1:20.3 is a scale in which the model is 1/20.3 the size of the real thing. This is the scale of the Bachman Shay and many other new models of narrow gauge trains. 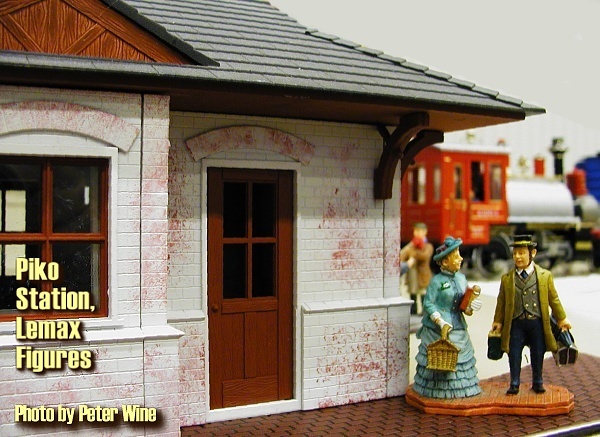 The Bachmann figures look at home in this scale. Even though they're not much taller than the 1:22.5 LGB figures, their heads are proportionately larger and they are wider, so they look like big models of 5'5" people instead of small models of 6' people.